When the Titan TP-Pro 8400 first came out in 2014, it was one of the first brand name models to showcase an extended L-track roller system. 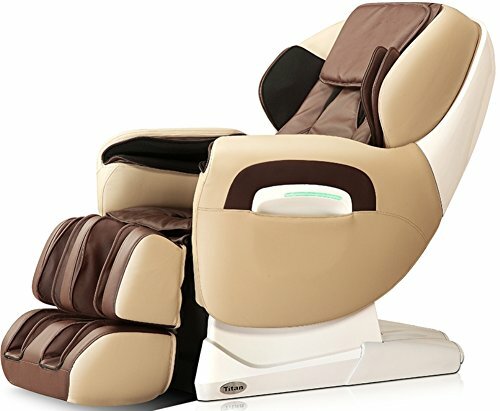 Today, the 8400 remains relevant in the massage chair market through its quality assembly, reliable features, compact size, classic design, and last but not least, affordable price. The Titan TP-Pro 8400 is manufactured by Titan World LLC. Titan World is one of the top distributors of handheld massagers, electric massage chairs, foot massagers, back relief products, and fitness machines. Titan World’s number one priority is to provide helpful equipment that can relax the body, allowing you to practice a more active lifestyle. If you’re an Osaki fan, these Titan line of chairs are worth a look because they come from the same factory as Osaki uses. The Titan TP-Pro 8400 has a main body dimension of 48 L x 30 W x 34 H (inch) and an Armrest dimension of 42 L x 16 W x 31 H (inch). L-Track Massage Function – This function provides assistance to both the back and the neck, specifically the lumbar area. This position helps increase the effects of a massage as it helps enable each of your spine’s discs to individually decompress and separate. Rollers on this track begin in the neck and follow the whole extension down to the buttocks. Zero Gravity Massage – This feature is inspired by the technology of NASA. The Zero Gravity position works as the ideal position to actually enjoy a massage. It is designed to align the back relative to the thigh at a level of comfort that is optimal. When you are reclined into a zero gravity position, the full weight of your back is virtually assisted by the backrest which maximizes the whole massage intensity. This helps improve spinal decompression and it also decreases muscle tension for the spine. Auto Recline – This feature functions via the recline button on the remote and the chair will automatically rise and recline. The backrest and leg move independently from each other. Foot Roller Massage – There are 2 rows of reflexology massagers on the bottom of the feet. It has rollers that spin and stimulate the acupuncture points. When the airbags inflate, a deeper massage will be generated towards the bottom of your feet. Heating Function on Back – Placed in the lower back region of the chair are 2 heating pads that enhance the massage experience. Easy to Use Remote – The Titan TP- Pro 8400 remote helps you to select the massage type, intensity, location and speed. You can also separately select the area of the airbag massage. The manual mode massage includes tapping, kneading, rolling, shiatsu, combination and punching. Air intensity adjustment – The air intensity of the airbags can be shifted between 5 levels, starting from mild to strong. Leg Adjustments – The chair’s foot portion is placed on a spring action track that extends out when enough pressure is applied. Your feet will constantly be massaged via an advanced air massage system. Arm and Hand Massage – There are a multitude of airbags located on the top and bottom of the forearm. These inflate and apply a compression massage. Calf and Foot Massage – Several air bags along the back and sides of both the legs are present. These inflate and apply a compression massage while along the bottom, there are feet massagers with spinning rollers that apply a pin-point kneading massage. For a budget chair, the 8400 is feature-rich. You get a full massage on your back and down to your glutes, and your legs and arms get the same treatment too with the foot massage extending up to calves and feet. Overall, you’re getting a full-body massage from your head to the bottoms of your feet. The heating is another noteworthy feature. We’ve already discussed this as a feature but this needed to be mentioned again as a huge pro. If you suffer from lower back pain or swollen feet, you will benefit the most from the zero-gravity features of massage chairs. When your feet are level with or higher than your heart, your circulation is improved and pressure from gravity and your body weight taken off your aching back and hips. The Titan TP-Pro 8400 was the first massage chair to come out with foot rollers with adjustable settings. The Kahuna LM6800, for example, despite being an excellent chair, has rough foot rollers. The quick fix was to stuff them with the packing foam that came especially for this purpose. With the Titan though, no foam stuffing is needed. While both models and brands have intense foot massages, you can decrease the intensity by simply adjusting settings on your remote control. There are 3 speed settings you can choose from, and you can even turn off the foot rollers altogether. We enjoy the foot massage on this model though as we can feel a rolling massage on both the balls and arch of the feet. A lot of modern massage chairs have rather narrow spaces in between their shoulder airbags. If you’re a rather big person or one with broad shoulders, it’s usually a tight fit in this case. This massage chair though was designed with its shoulder airbags flaring out. This gives more space for people with larger bodies to sit back in better. Most premium massage chairs are quite gigantic for good reason. The Titan 8400 is a space-saving chair though. This means you can fit it in smaller rooms and the classic two-tone design will ensure that it won’t look out of place wherever you decide to place it in. If you go to a chiropractor for regular sessions and are looking for a stretch program, check out the Inada Dreamwave. The Titan TP-Pro 8400 is a reliable and solid chair in terms of performance and features. It might not be the cheapest massage chair in the market, but for its list of features, the price is truly value for money. It also has a good track record in terms of durability and longevity.